One of my fondest memories as a child involves my grandmother and Saint Jude the Apostle. In the Roman Catholic tradition in which I was raised, Saint Jude is known as the saint of desperate cases and lost causes. I remember making special trips with my grandmother – sometimes with her sister along ― to Saint Jude’s Roman Catholic Church in San Antonio. The church was open throughout the day for anyone to enter. I remember entering quietly. Since it was not our home parish and we went during an off hour, I paid close attention to my grandmother’s actions. We walked over to the area where candles are available for lighting. My grandmother placed a dollar or two in a little donation slot. She picked up a small wooden stick, placing it in a lit candle to use the flame from someone else’s prayer to light the candle for her own special intention. After the candle was lit, we knelt in silence near the rows of candles and prayed. After praying near the candles we migrated over to the pews, knelt down again, and continued praying. 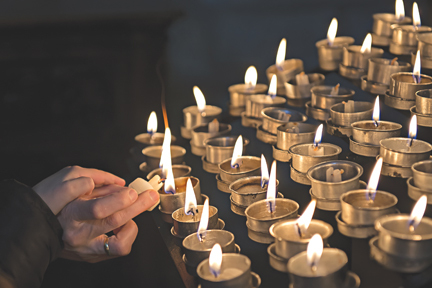 Once or twice in my early twenties I found myself visiting Saint Jude’s, following in my grandmother’s footsteps of lighting candles and praying for things that seemed to me like lost causes. As a child, the ritual of going to Saint Jude’s to light a candle and pray seemed a little bit like a chore. But as an adult I began to understand that we go through times when life can feel empty and hopeless. During those times, I began to see why my grandmother would take the time to light the candles and offer prayers to Saint Jude. From the time I was an infant, saints have been a part of my life. I was baptized and confirmed at Saint Paul’s Roman Catholic Church, named after the apostle Paul who took the word of Christ to the Gentiles. Later I attended first through fourth grade at the church’s school. The nuns who served as teachers and staffed the school were the Sisters of Saint Brigid from Ireland, lovingly called “The Brigidines” by the church and school community. The sisters took their name from Saint Brigid of Kildare who was an Irish nun that played a foundational role in establishing monasteries and centers of religious learning in Ireland. Though as a child I didn’t give it much thought, I realize now that Saint Paul and Saint Brigid were bright and strong enough to impact future Christians like the Brigidines who devoted their lives to building up the church, school, and community that loved and nurtured my family. In college and early adulthood another saint caught my attention. This time, it was Saint Augustine of Hippo. I remember a professor lecturing about Saint Augustine’s Confessions, particularly an account of the saint’s lustful youth. Somehow the humanization of this saint as a sinner who went through a transformation of repentance as he was older caught my attention. Now this was someone to whom I could relate ― a person who gave me hope that even in our mistakes God’s grace can still find us and we can be used for great things. After college when I began the process of confirmation, and when it came time to choose the name of a saint for my confirmation name I settled on Augustine. His humanness as well as his writings and doctrinal contributions made him appealing to me. In fact now that I have been a practicing Episcopalian for almost four years, Augustine surfaces again in my readings. I remember reading somewhere that the writings he did on predestination impacted Luther, an Augustinian monk, who in turn played a vital role in the Reformation. Saint Augustine continues to intrigue me and reminds me that no matter what, God can always use us for his purpose. Reflecting back on my experiences with the saints I realize I did not spend a lot of time reading about them or praying to them on my own. However, it is clear to me now as an adult that the saints had an effect on me. The good works of the saints laid a foundation upon which future generations built communities that still influence our present day lives. The stories of the lives of the saints continue to provide example, inspiration, and comfort. My grandmother, who still prays the rosary daily, calls upon Saint Jude as needed. The Brigidine Sisters who devoted their lives to the community of my youth and whose lessons continue to have an impact on me as an adult, will flow forward in my own children. When I see the spiritual threads running through these events of my past, present, and future, I begin to get a glimpse of what is meant by the communion of saints where the dead and the living are joined together with Christ. In the communion of saints I see a community of people who devote their lives to making God’s presence known to others. As an adult this gives me the small courage to ask, “What small things can I do to make God’s presence known to others?” and “How can I help build upon the foundations of the saints to ensure the gifts of our spiritual traditions continue for generations to come?” I don’t have a lot of concrete answers. But when I ask the questions, I know that God answers in his time.